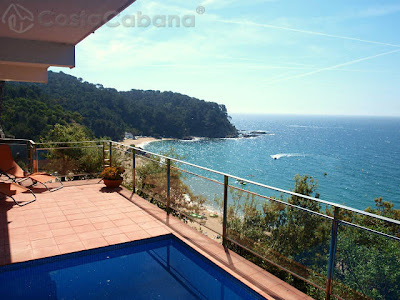 In Costa Brava of Spain, you can easily rent a Holiday Villa with a private pool. You can rent one that is directly facing the beautiful sea and wake up in the morning greeted by the warm sunshine at Costa Cabana. This is an excellent choice as Lloret de Mar which is 75 kilometers from Barcelona is easily accessible via the Girona Airport. It offers you a romantic gathering and a luxurious private accommodation. This place has a vibrant nightlife and many dining options to choose from. If you want to enjoy the mild climate of spring or autumn, Costa Brava holiday villas with these beautiful landscapes around the Mediterranean really has a lot to offer. You can get there easily by car. Besides the privacy, it is only five minutes to the beach. The sea view is marvelous over the bay of Cala Canyelles. Facilities included in the villa are DVD player, washing machine, refrigerator, coffee machine, kitchen stove, oven, microwave, water cooker, toaster, television, Internet, air conditioning, swimming pool, three bedrooms for two persons each. Two bathrooms, garden furniture, terrace, Barbecue pit and a garden. This characteristic house is located in a quiet and rural location that offers breathtaking views, great atmosphere, privacy, child-friendly yet comfortable and cultural environment. Click to see more photos of the Villas in Spain now.